2015 Las Vegas HempFestLegendary comedian, actor, musician and cannabis crusader, Tommy Chong, will have a special appearance at the second annual Las Vegas HEMPFEST and Educational Expo on October 3, 2015. The event takes place at the Las Vegas Convention Center with entertainment, vendors and education seminars. Tens of thousands of visitors are expected to attend. The first event in 2014 saw more than 10,000 people come through the gates. Las Vegas HEMPFEST is an officially licensed partner with America's largest marijuana festival the Seattle HEMPFEST, which has supported the Cannabis/Hemp legalization movement for 25 years. Medical marijuana dispensaries are now open in Nevada. An effort is underway for full legalization in 2016. This event is to celebrate progress. As Educational Seminar Producer of the Las Vegas Hempfest, Freedom Leaf, Inc. has engaged NORML to work with Freedom Leaf and "Ask Nurse Juhlzie" to introduce to this year’s event an education element that will attract those in the Cannabis/Hemp Industry including entrepreneurs, investors, manufacturers/wholesalers, lawyers, doctors, nurses, other medical personnel, and the media. Las Vegas HEMPFEST is donating a portion of all ticket sales to NORML. This is to honor the National Organization for the Reform of Marijuana Laws for its 45 years of dedication to legalization. "We are honored to be a partner for this event in our hometown," said Freedom Leaf CEO Cliff Perry, "This is a time for celebration and education as we get closer to the real goal of full legalization." The outdoor portion of Las Vegas HEMPFEST 2015 will cover 600,000 square feet (across from the Las Vegas Convention Center) with 2 stages of live music, speeches from activists and the Cannabis Progress Awards. Music performances will include: STAGE HOSTED BY MTV WILD & OUT SPANKY & MEDICINAL MIKE, Musical Headliners: ISRAEL VIBRATION, AFROMAN, KOTTON MOUTH KINGS, MARLON ASHER, WEST SIDE CONNECTION WC, CHANEL WEST COAST, NATURAL VIBRATIONS, WU TANG CLAN MEMBERS, NEW AGE TRIBE, DIZZY WRIGHT DJ FAME, JACKAL/PHOENIX and many more. The indoor portion will be in the Las Vegas Convention Center Conference Rooms N262/N264 and will feature panels of cannabis industry experts, advocates and celebrities along with the first of its kind Medical Cannabis Educational Lectures by National Nurses from across the nation. Panel themes include a general session on the state of marijuana reform in America; Legal Issues for the Cannabis Industry and Business Perspectives; Veterans and Medical Marijuana, Cannabis Growing Techniques and Extract Artistry. Viridian Capital Advisors, LLC will provide a financial session that explains the investment atmosphere of the Cannabis/Hemp Industry. Speaking on main stage and on panels at Las Vegas HempFest 2015: Nevada State Senator Tick Segerblom, Keith Stroup founder of National NORML, Richard Cowan co-founder of Freedom Leaf and cannabis entrepreneur, Yoshi the award winning cultivator, Kyle Kushman author and expert cannabis cultivator, Chris Lopez, Jerry Whiting a world known CBD expert, Robert Platshorn of the Silver Tour, Lynette Shaw a pioneering medical marijuana dispensary owner, Cynthia Schindel Engstrom from Arizona NORML, and legal experts from Peter McWilliams.org and Ken Sobel Esq. who are leading the way. Expert Nursing Panel, sponsored by Ask Nurse Juhlzie, Medical Cannalyst and The American Cannabis Nurses Association (ACNA), are conducting a series of lectures on the role of nurses in the Cannabis Industry and the science behind the plant. This will include modules from National Nursing experts, Heather Manus RN, Julie Monteiro RN, Marcie Cooper RN, and Lisa Buchanan RN, to name a few, who are soon to be launching the first ever Cannabis Nurses Magazine, a national platform to present news on the latest in Cannabis Nursing. The private VIP back stage party will be full of celebrities, performing artist, live DJs, Hemp Flavored Vodka Bar provided by sponsor Elation, a video game arcade, and a Hookah lounge. General admission ticket prices are $45 in advance and $50 at the door on the day of show. VIP passes are $250.00 each and include back stage party along with VIP after-party. Las Vegas HempFest benefits National NORML and marijuana legalization! We hope to see you there! Tommy Chong has a good theory regarding the presidential race. He says Hillary hired Donald Trump to decimate the Republican party. Chong may be right. Trump donated a lot of money to Hillary's campaign and Trump has been a huge supporter of the Clintons. He also thinks Chris Christie smokes weed...because he looks like he has the munchies. Legendary comedian, actor, musician and cannabis crusader Tommy Chong will have a special appearance at the second annual Las Vegas HEMPFEST and Educational Expo on October 3, 2015. The event takes place at the Las Vegas Convention Center with entertainment, vendors and education seminars produced by Freedom Leaf, Inc. (OTC PINK: FRLF). Tens of thousands of visitors are expected to attend. The first event in 2014 saw more than 10,000 people come through the gates. Las Vegas HEMPFEST http://www.lasvegashempfest.com is an officially licensed partner with America's largest marijuana festival, the Seattle HEMPFEST, which has supported the Cannabis/Hemp legalization movement for 25 years. As Educational Seminar Producer of the Las Vegas HEMPFEST, Freedom Leaf, Inc. (OTC PINK: FRLF) has engaged NORML www.norml.org to work with Freedom Leaf and "Ask Nurse Juhlzie" asknursejuhlzie.com to introduce to this year's event an education element that will attract those in the Cannabis/Hemp Industry including entrepreneurs, investors, manufacturers/wholesalers, lawyers, doctors, nurses, other medical personnel, and the media. "We are honored to be a partner for this event in our hometown," said Freedom Leaf CEO Cliff Perry. "This is a time for celebration and education as we get closer to the real goal of full legalization." The Vendor Village will host hundreds of businesses including food, hemp clothing and products, literature and education booths, high quality glassware, vaporizer products, hemp skateboards, hemp guitars, trim and nutrient companies, the 420 Carnival with rides, a Miss Hempfest contest and cannabis cultivation exhibits. Panel themes include a general session on the state of marijuana reform in America, Legal Issues for the Cannabis Industry and Business Perspectives, Veterans and Medical Marijuana, Cannabis Growing Techniques and Extract Artistry. Viridian Capital Advisors, LLC (www.viridianca.com) will provide a financial session that explains the investment atmosphere of the Cannabis/Hemp Industry. Speaking on main stage and on panels at Las Vegas HEMPFEST 2015: Nevada State Senator Tick Segerblom; Keith Stroup, founder of National NORML; Richard Cowan, co-founder of Freedom Leaf and cannabis entrepreneur; Yoshi the award winning cultivator; Kyle Kushman, author and expert cannabis cultivator; Chris Lopez; Jerry Whiting, a world known CBD expert; Robert Platshorn of the Silver Tour; Bruce Perlowin, CEO of HEMP, Inc.; Lynette Shaw, a pioneering medical marijuana dispensary owner; Cynthia Schindel Engstrom from Arizona NORML; and legal experts from PeterMcWilliams.org and Ken Sobel Esq. who are leading the way. The private VIP back stage party will be full of celebrities, performing artists, live DJs, Hemp Flavored Vodka Bar provided by sponsor Elation, a video game arcade, and a Hookah lounge. About Freedom Leaf, Inc. (OTC PINK: FRFL): Freedom Leaf, Inc. (OTC PINK: FRLF) -- "The Marijuana Legalization Company™" -- is a leading marijuana-related News, Multi-media, Entertainment, Branding, Business Development and Incubation company. Freedom Leaf, Inc. was incorporated in June 2014 in Las Vegas by long time activists Richard C Cowan and Clifford J Perry. They have over fifty years of combined experience in the pursuit of Marijuana/Hemp Legalization. About Viridian Capital Advisors, LLC Viridian Capital Advisors, LLC is the first Wall Street investment bank and advisory platform dedicated to the Cannabis market. We are a specialized boutique banking and strategic advisory firm that provides research, investment banking, investor relations and corporate development services to emerging growth companies in the cannabis sector. Our banking practice, through broker-dealer Pickwick Capital Partners, provides capital and M&A to fund the growth of our clients, while our advisory practice helps to position and build their business. Leveraging our team's decades of high level operating and transaction experience on Wall Street, in industry and in the government, we provide flexible comprehensive strategic and financial solutions that assist cannabis enterprises in realizing their full potential. For more information, please visit http://www.viridianca.com. Forward-Looking Statements The statements in this press release constitute forward-looking statements within the meaning of federal securities laws. Such statements are based on our current beliefs and expectations and are inherently subject to significant business, economic and competitive uncertainties and contingencies, many of which are beyond our control. In addition, such forward-looking statements are subject to assumptions with respect to future business strategies and decisions that are subject to change. Potential risks and uncertainties include, but are not limited to, technical advances in the industry as well as political and economic conditions present within the industry. We do not take any obligation to update any forward-looking statement to reflect events or developments after a forward-looking statement was made. Tickets for the 2015 Santa Barbara LOL Comedy Festival (SBLOLFEST) are now available for purchase at www.sblolfest.com featuring an all-star line-up of headline comedians. This year's line-up will include Kira Soltanovich (Tru TV's "How To Be A Grown Up" and "The Tonight Show"), Brad Williams (Showtime Comedy Special "Fun Size"), Dan St. Germain (Comedy Central), Steve Lemme & Kevin Heffernan (Broken Lizard, "Super Troopers", "Beerfest"), Cheech Marin (Cheech & Chong) Willie Barcena (Showtime), Monique Marvez, (Showtime), Steve Trevino (Showtime) Jeff Garcia (Showtime) and festival finale night Chris Hardwick ("@Midnight", "Talking Dead", "The Nerdist") Andy Daly (Comedy Central's hit "Review"). Shows will take place over two back-to-back weekends in Santa Barbara's Historic Theatre District at the Lobero and Arlington Theatres. For a complete line-up of shows and ticketing information go to sblolfest.com. KIRA SOLTANOVICH • HEADLINES HOT FUNNY FEMMES • Thur. Oct. 8 • 8:00 PM • Lobero Theatre Kira Soltanovich (Tru TV's "How To Be A Grown Up", "Girls Behaving Badly" and "The Tonight Show") headlines this evening of sassy, confident, national touring headlining female comedians Kate Quigley, Jenny Zigrino, Karen Rontowski and Hosted by Real Housewives of Orange County Alum Gretchen Christine Rossi. ++++++++++++++++++++++++++++++++++++++++++++++++++++++++++++++++++++++++ BRAD WILLIAMS • HOSTS RINGMASTER • Fri. Oct. 9 • 8:00 PM • Lobero Theatre Brad Williams, coming off his hit Showtime comedy special "Fun Size" filmed at the 2014 SBLOLFEST showcases the top music comedy performers for this year's Next Up Stand-Up Featuring Eric Schwartz & J. Chris Newberg and more TBA. ++++++++++++++++++++++++++++++++++++++++++++++++++++++++++++++++++++++++Broken Lizard's Steve Lemme & Kevin Heffernan LIVE • Sat. Oct. 10 • 8:00 PM • Lobero TheatreBroken Lizard, Super Trooper and Beerfest's own funnymen headline a night of Live laughs. Kicking off the evening will be Comedy Central's Dan St. Germain.++++++++++++++++++++++++++++++++++++++++++++++++++++++++++++++++++++++++THE SECRET SHOW • So secret we don't even know where and when it will be. The Secret Show location and tickets will be announced to our mailing list and VIP Pass holders several days prior, and the headliner will be announced the day of. Tickets are very limited to this show so pay attention!++++++++++++++++++++++++++++++++++++++++++++++++++++++++++++++++++++++++ CHEECH MARIN AND LEGALLY BROWN TU/2.0 • Fri. Oct. 16 • 8:00 PM • Arlington TheatreHosted by Cheech Marin Legally Brown Tu/2.0 is a humorous and ironic look at the obvious through the eyes of some of today's top Headlining Stand-Up Comedians (all respectively having their own one hour specials on the Showtime Network) Steve Trevino, Monique Marvez, Jeff Garcia & Willie Barcena. All on one show and all of whom just happen to be "Legally Brown." Featuring: Q104.7FM's Rico and Mambo and Special Guest Rick Najera a.k.a Bubba Gomez++++++++++++++++++++++++++++++++++++++++++++++++++++++++++++++++++++++++++++++++CHRIS HARDWICK HEADLINES THE NERDY SHOW • Sat. Oct. 17 • 8:00 PM • Arlington Theatre The final show of the SBLOLFEST takes place at the Arlington Theater with Comedy Central Favorites Andy Daly (starring in Comedy Central hit show "Review") and headliner "The Nerdist" Chris Hardwick. STATESVILLE, NC--(Marketwired - Sep 3, 2015) - Bebida Beverage Company (OTC: BBDA) (BeBevCo), a developer, manufacturer and marketer of relaxation and energy products, announced today that the company and its partially owned subsidiary, Relaxations Solutions Inc., are going into their first production of Cheech and Chong Chillaxation drink®. 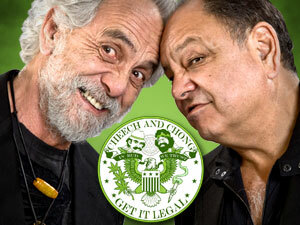 The upcoming product is named and licensed after movie icons Cheech and Chong. BeBevCo's industry experience, with its growing KOMA Unwind Liquid Relaxation® products success, is a benchmark for the company's latest endeavor. "We were so excited to bring the Cheech and Chong Chillaxation drink® brand into our product family last year," said BeBevCo CEO Brian Weber. "Several factors created unforeseen delays; however, it's happening now. We will be having an invitation only social to celebrate the launch of this great product." In the coming weeks, BeBevCo will announce a hard production date from their Pepsi bottling partner. Additionally, the Statesville, North Carolina-based company will disclose actual availability to consumers. "The drink itself will use natural supplements, natural flavors and sweeteners, as well as a dose of Hemp," added Weber. "This is an exciting product launch for us. It will add a significant amount of revenue to our bottom line, as well as help continue forward momentum for the relaxation drink category as a whole." Pre-orders are available for consumers who wish to receive Cheech and Chong Chillaxation drink® before its initial launch. Please visit gofundme.com/wr8pzvwg (the pre-orders via go fund me are imminent and not dependent upon any particular amount raised) for details and pre-order information. Like Cheech and Chong Chillaxation drink® on Facebook by clicking here. Cheech and Chong Chillaxation drink® is also on Twitter. Follow them @CheeChongdrink for more information and announcements. BeBevCo (Bebida Beverage Company) develops manufactures and markets liquid relaxation products including KOMA Unwind® Liquid Relaxation®, KOMA Unwind® Sugar-free Liquid Relaxation®, and KOMA Unwind Liquid Relaxation Shots®, as well as POTENCIA Energy, POTENCIA BLAST Energy Shots, Relax 5 Shots and the all-new Cheech and Chong Chillaxation drink®. KOMA Unwind® currently garnishes over 75 percent of brand awareness in the rapidly expanding relaxation drink category in the United States. Additionally, KOMA Unwind® has been featured in The Oprah Magazine, Bloomberg News, the Wall Street Journal, Women's Health and many other publications. Cheech and Chong have announced their first new tour date since Tommy Chong began cancer treatment. On January 29, 2016 the Cheech and Chong Up in Smoke tour with WAR is coming to the Grey Eagle Resort and Casino in Calgary Alberta Canada. He says he's been using marijuana as a pain killer during this cancer battle. The pain is so bad he has to wake in the middle of the night to smoke up. It's actually called Almost Legal. Tommy Chong has teamed up with popular app WeedMaps for a sketch comedy series aimed at the "stoner" audience. Almost Legal, starring the comedian and featuring such guests as Hannibal Burress, Danny Trejo, Steve-O, Andy Milonakis and Garfunkel and Oates, will air via FilmOn Networks which has secured distribution over Dish Network in addition to its own streaming site FilmOn.com, claiming 70 million monthly uniques internationally. The show is directed by his son, Paris (nepotism alert). Paris has no noteworthy experience directing so I guess Tommy insisted on it. Legally Brown Comedy Show that premiered on Showtime and will be all on one stage for one evening of laughter. Where: Arlington Theatre, Santa Barbara, California. Tickets are on sale now via the ticket links above.